Welcome to Talbot Denture Clinic Adelaide, the home of Affordable Sports Mouthguards that are made onsite at Lockleys, in Adelaide's Western Suburbs. Wearing a Custom Fitted Sports mouthguard while playing sport can spread the impact of a blow to a persons face, and help reduce injury to the jaw, lips and tongue. 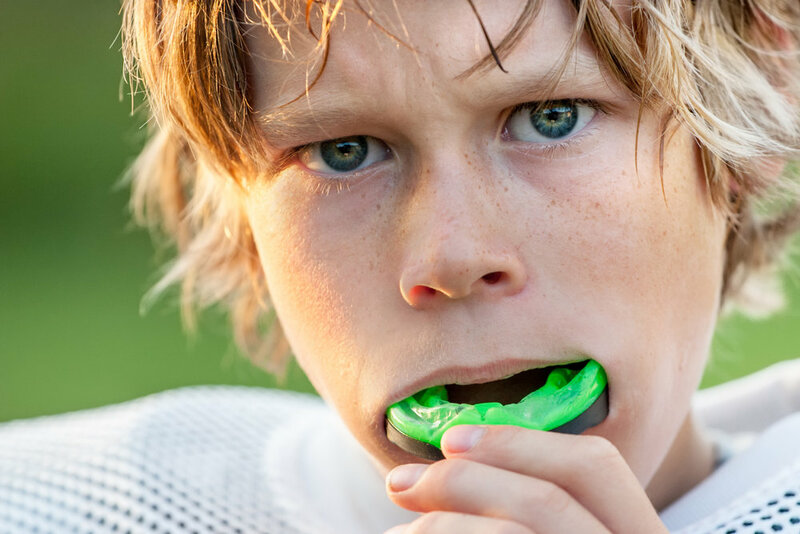 The same impact without a sports mouthguard could result in damage to the players teeth or jaw. A Custom Fitted Sports Mouthguard is the best way to prevent injuries like these, especially if you participate in full contact sport or other rigorous activities. A Custom Fitted Sports Mouthguard will allow you breathe and talk easily without it falling out . The best and most superior Sports Mouthguard is one that has been fitted by a Dental Prosthetist at a Denture Clinic. There are three main types of Sports Mouthguards on the market today. These are made by your local Dental Prosthetist. They are Custom Fit for you personally and give the maximum protection and comfort. Stock Sport Mouthguards come pre-formed and don't adapt to your mouth perfectly. They can be bulky and can offer little protection and can make it hard to talk and breath. Boil and Bite Sort Mouthguards are often sold at chemists or supermarkets. These mouthguards are heated up in water, then bitten into. They also offer little protection and don't fit properly, making it hard to talk and breath. A frequently asked question is that if a Custom Fitted Sports Mouthguard can be adapted over braces while somebody is in the middle of Orthodontic treatment to straighten there teeth? The answer is Yes. A Custom Fitted Mouthguard can be made over braces and makes no difference in the level of protection and comfort one would receive from this product.